The Gallic Sector, astronomically independent of Sirius, is split into the Core Worlds and Border Worlds, and is located somewhere in the region of 700 light years to the relative northwest of Bretonia. Less of this sector is known to be charted, with only 10 systems surveyed and mapped, most of which fall into the national space of Gallia. The Colonies are home to seven major governments, commonly referred to as Houses: Liberty, Rheinland, Bretonia, Kusari, Gallia, the Nación Maltesa (Outcasts) and the Imperio del Corsario (Corsairs). 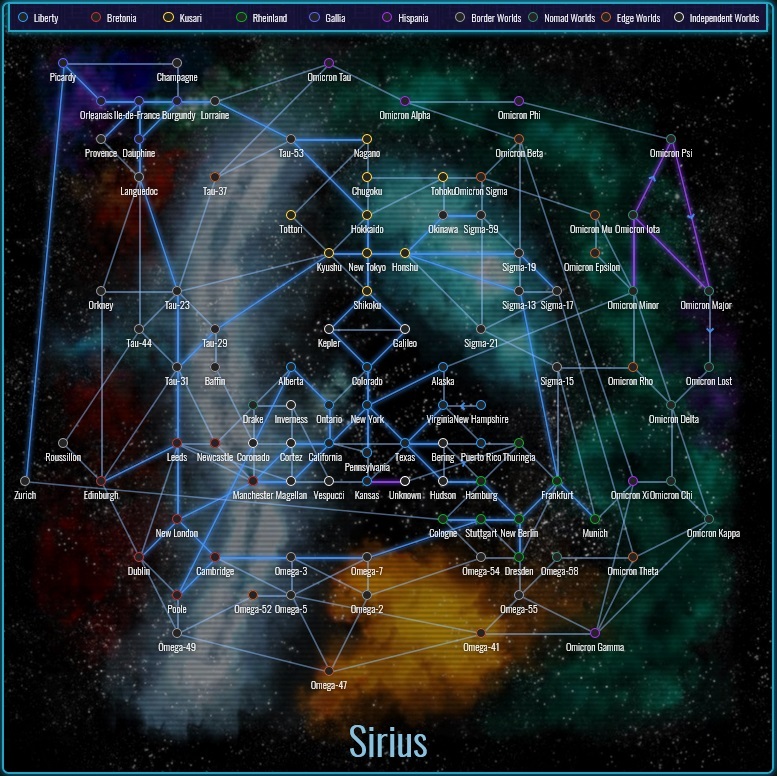 While a number of smaller organizations, such as the Crayter Republic, Sirius Coalition, Imperium Omicronis or the Gas Miners Guild often describe themselves as Houses as well, their claims are usually disregarded by the other Houses, citing their lack of size, power and influence to be considered more than just local governments. Geographically, the Sirian Houses are located at and around the center of their Sector. The Kingdom of Gallia is located at the edge between the Sirius and Gallic Sector. House space is generally considered safe for its citizens, free of major stellar hazards and rich in resources, although there are multiple notable exceptions to this, such as Kusari's northern colonies, the Maltese Razgriz Black Hole area, or Corsair space in general. However, caution is advised for Inter-House travelers: Gallia, the Outcasts and the Corsairs are often less-than-welcome to foreigners, and while the Gallic Navy is known to merely attempt to block unauthorized intrusions, the Outcasts and Corsairs have a reputation for pirating civilians or outright capturing them and selling them into slavery. The Colonies are home to many large and small nebulae, the largest of them being the Crow Nebula, the Walker Nebula, The Barrier and the mysterious Edge Nebula. While all but the Edge Nebula have been thoroughly mapped, traveling through Colonial nebulae can still be quite dangerous; they often contain dangerous pockets of radiation, explosive gases and deadly asteroids, and they also make perfect hiding places for the many pirate and terrorist organizations of Sirius as scanner and radio waves often have great difficulties penetrating them and the poor visibility inside the clouds hides them from plain sight. Adventurous Freelancers should consider reading our Guide to the many Hazards they may encounter on their travels before leaving the relatively safe House space and venturing into the depths of the Colonial nebulae. Sirius and Gallia are home to quite a large number of stellar anomalies, containing not only a large number of Baxter Objects but also major anomalies like the Badlands and even an awe-inspiring Black Hole. In addition, large numbers of Jump Holes and Gate paths span a gargantuan transit web throughout the Colonies and enable economically feasible, extremely fast interstellar travel. While some of these anomalies are of natural origin, others have been theorized to be artificial "constructs" of the Daam K'Vosh. Not much is known about what lies outside the Colonies. No stellar bodies have been surveyed during the flight of the Sleeper Ships; the single sleeper ship which launched before the war did not return much useful information either - it arrived in Sirius at the dawn of the 9th Century only to bring news of the demise of their own home by a natural disaster. The fate of the Sol system itself was largely unknown and it's people where presumed to be under Coalition control until the late 8th century, when edge world astronomers discovered Sol's name-giving G2V-class star turning into a bright flash of light. While it is generally agreed upon that this event has turned humanity's cradle into a barren wasteland, the reasons for this are currently unknown. However, there was one report of a Nomad Super Weapon, but those theories have been denied by the house governments. This page was last edited on 18 March 2019, at 14:51.